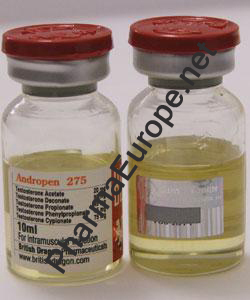 Andropen 275 is a five-ester blend of testosterone produced by British Dragon, and is clearly an attempt to profit off of the popularity of Sustanon. Actually, if you are inclined to use blended products such as this (and personally, I´m not anymore), then I think you´ll find this to be a product far superior to Sustanon. Andropen contains 20mgs of Testosterone Acetate, 75mgs of Testosterone Cypionate, 90mgs of Testosterone Decanoate, and 40mgs each of Testosterone Propionate and Phenylpropionate in a 20ml bottle. I am very impressed with the fact that this product appears to be designed specifically for bodybuilders and athletes, and certainly if I wanted to create a long, medium, and short estered testosterone product, it would be something like this one. Also, due to that fact, I think I´d recommend shooting it EOD, or E3D or so& .giving you a very decent and relatively stable level of hormone in your body. A few years back, I made a testosterone blend for my own use out of powders, which was essentially a five estered testosterone (the same esters as Sust + 100mgs of test with the Cypionate ester per milliliter). Anyway, now it seems that every Underground Lab is involved with this type of thing. It´s not uncommon to see a price list with several "custom blends" or "house blends" of various estered testosterone´s (or sometimes Trenbolones, or whatever). Testosterone is a relatively cheap drug (the cheapest, actually, in terms of anabolics), and that´s why it´s not actually a bad choice for blended products. In terms of "bang for the buck", it´s a great choice, as it can do just about everything. It induces changes in both the shape as well as size as muscle fibers (1). It can change the appearance and the number of muscle fibers (1), also, which is definitely a good thing for the cosmetic athlete (read: bodybuilder). Testosterone has the profound ability to protect your muscle from catabolic (muscle wasting) glucocorticoid hormones (2), although not as well as (for example) Tren or other such (more expensive) drugs. Glucocorticoid hormones send a message to muscle cells to release stored protein, while Testosterone sends a message to muscle cells to store more contractile protein (called actin and myosin). In this way, these two hormones are at war with each other to cause anabolic vs. catabolic effects. Usually they are at a stalemate (which is why you don´t gain weight constantly, nor lose it). When you add in some Testosterone (such as Andropen 275), you shift the scales in favor of anabolism, and away from catabolism. In addition to this, Testosterone has the ability to increase erythropoiesis (red blood cell production) in your kidneys (3), and a higher Red Blood Cell (RBC) count is highly sought after by many athletes because it may improve endurance via better oxygenated blood. More RBCs can also improve recovery from strenuous physical activity, and seems to give the muscles a more "full" look when bodyfat levels are reasonably low. Agression levels often rise dramatically with the use of exogenous testosterone (9), and due to some of the short esters in Andropen 275, I´d expect this effect to become realized within the first day of injection. All of these great benefits are to be had with the use of test enth alone, but realistically, it will be part of a cycle containing one or more other drugs. People who are bulking will probably choose Deca or Eq (possibly with Dbol as well) and those who are cutting will probably steer towards Eq and perhaps Trenbolone. Very often users will shoot this drug once or twice a week, but blood levels are still above baseline with this drug at around day eight (10).Common wisdom holds that the testosterone portion of any such cycle should be equal to or greater than any other injectable drug(s) portion (on a mg basis)& I believe that you can get away with less, but in general, this is a good guideline. The real advantage to this product, in my opinion, over Sustanon is in its practicality. As you know, I´m not a huge fan of multi-estered products, because it seems that this gives the manufacturer carte blanche to charge whatever they want. Well, this product costs roughly $75.00, for a 20ml, multi use vial. When compared to buying Sustanon by the amp, you could be paying up to $25.00 more for the same amount of testosterone. If you are looking for a product of this nature, this is one that I would actually recommend. Really, as I´ve said numerous times, the one principal drawback to using blends of testosterone tends to be their high cost as compared with single ester tests. If this product could be had cheaply, I wouldn´t hesitate to recommend it. Presentation: Comes in 20ml multidose vials. Each multidose vial contains 20 mg per ml of testosterone acetate, 90 mg per ml of testosterone decanoate, 45 mg per ml of testosterone propionate, 45 mg per ml of testosterone phenylpropionate, and 75 mg per ml of testosterone cypionate. 20ml multidose vials come with a light blue coloured top.